Deerhoof are a kind of paradox–innovators working in a tradition–deconstructing the whole of modern music (as well as not-so-modern-music) with their voices, drums, guitars, and keyboards. With Friend Opportunity, the San Francisco band has distilled the buzz and clatter, the melody, muscle, and grace of their past few albums (2005’s The Runners Four, 2004’s The Milkman, 2003’s Apple O’) into a concise, nearly-perfect 36 minutes. The Runners Four topped a lot of year-end lists last year, but to me it was overlong and undercooked–plenty of good ideas that needed to be edited and refined. With Friend Opportunity, Deerhoof achieves a beautiful balance, reining in chaos and noise in favor of punchy rhythms and hooks that are sure to sink into your mind. Not to say that the vibrant anarchy of past albums has been in anyway discarded or even subdued–Deerhoof have simply gotten better at using chaos as a musical element, a means to an end, rather than an uncontrollable variable. Tracks like album opener “The Perfect Me” and “+81” establish pop ideals, cribbing from classic rock riffs, only to deny, deconstruct and then revive these ideals–all in under three minutes. “The Galaxist” is particularly sweet, opening with Faheyesque guitar picking and breathy melodies, and moving into a joyous beat that would make Fela Kuti proud. If the world had better musical taste, “Matchbook Seeks Maniac” would be on every radio station, the perfect slow dance for the Bizarro World prom. The brevity of these tracks is a plus: most of the tracks on Friend Opportunity lack the repetition common to pop music, moving through several ideas in under three minutes–ideas that stick in the head, causing a listener to hit repeat. The album closer, “Look Away,” is the only track to deviate from this method. Clocking in at over 11 minutes, “Look Away” comprises nearly a third of the album’s content, and will undoubtedly not stand repeated listens by some listeners. 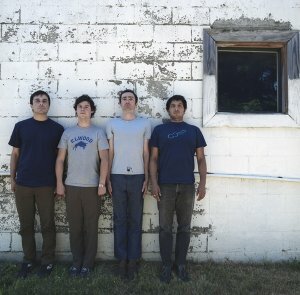 The track seems tailor-made for listeners who expect some noise from their Deerhoof, and those listeners won’t be disappointed. Nonetheless, even in an 11 minute anti-epic, Deerhoof controls the chaos and noise, resulting in some challenging and beautiful moments. Despite a 2007 release date, I consider Friend Opportunity one of the best albums of this year. I can’t wait to buy it.